Garden Grove edged out Huntington Beach in a tie with Newport Beach for “bronze” or third place in the most dangerous cities to ride a bike in the County. 11 bike riders were killed with 583 injured since 2001. 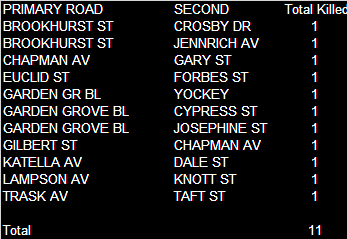 No street stands out as having a majority of collisions except Brookhurst and Garden Grove Blvd with 2 and 3 fatalities respectively across their length. 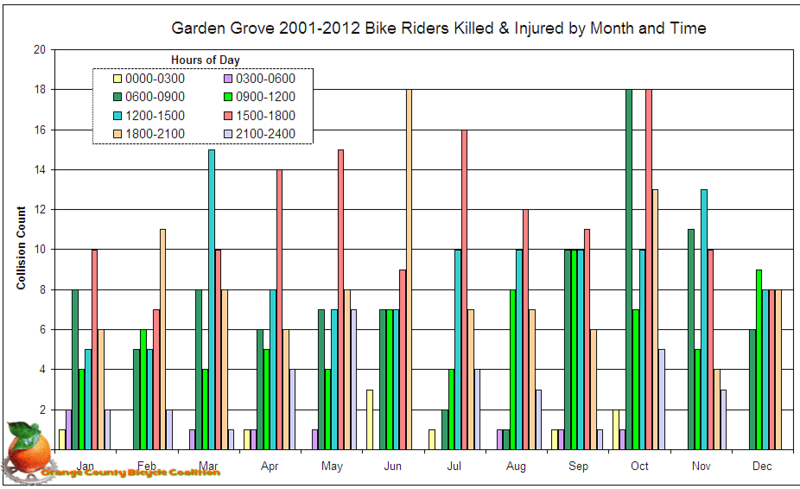 The most current Garden Grove records are from 12/29/11 which is laughable considering the current date of 10/25/12. On the other hand, maybe there was nothing to report! As much as we may wish that no collisions occurred between then and now, somehow we just know that the reality will sadly prove otherwise. It would be interesting to know the reason why and if someone want to leave an anonymous tip to the editor we’ll start a discreet investigation. And now for the pie charts! According to the assigned fault as shown, bike riders were responsible for their own death 55% of the time. The major rider fault is riding on the wrong side of the road. For the second time, Bicycling Under the Influence makes an appearance accounting for 18% of the fatalities, although the technical nuance between a citation for 23152 and 21200 are too fine for this writer’s eyes to discern. 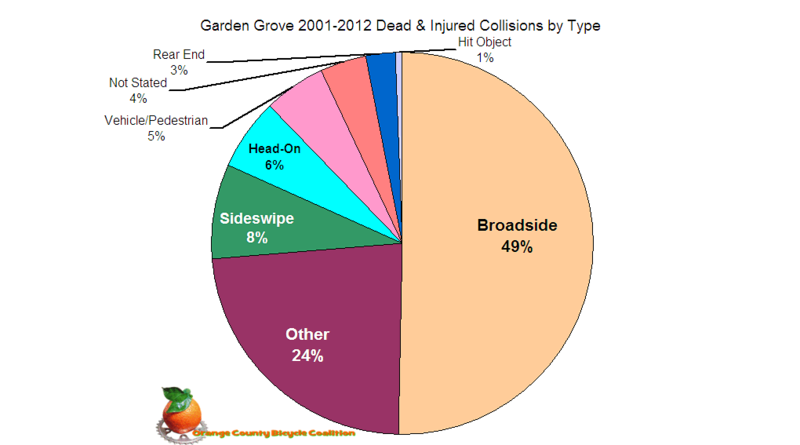 With almost one third, or 27% of collisions in the “unknown / not stated” category, even though 1/3 of those were attributed to speeding by at least one of the parties in the fatal collision, perhaps being able to figure out who was at fault for the collision is trickier in Garden Grove than in other cities. Since 27% could swing either way, it’s feasible that bike riders could be 82% at fault which is terrible, but better than Santa Ana’s 92%. 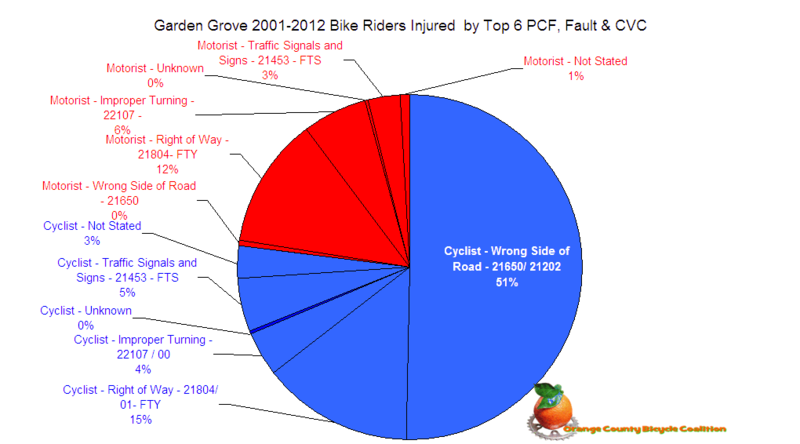 Drivers in Garden Grove failing to stop or failing to yield contributed the remaining 18 or 45% depending on the final assignment of fault. Riders again were responsible for over 75% of their injuries by colliding with other vehicles. Just like in Santa Ana, riding on the wrong side of the road is the predominant cause of collisions. Given the demographic makeup of Garden Grove, could cultural traditions or mores also be in play for this behavior? Perhaps better enforcement of the rules of the road to violators is in order. Certainly an educational outreach is needed and we look forward to partnering with agencies to work with to improve the understanding of the rules of the road. 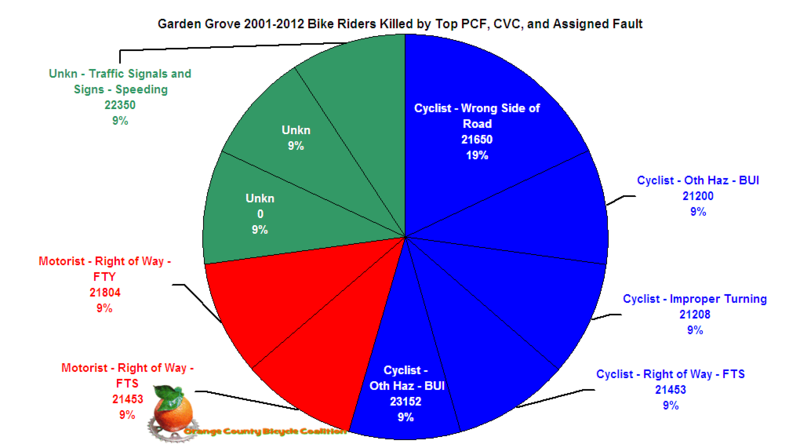 According to the CHP population index, Garden Grove could have more than twice the population of Newport Beach, so maybe it’s commendable that despite the greater number of people in the city, fatalities are on par with a city half its size (at this point in time), while bike riders injured in Garden Grove are less than Newport Beach at 583 and 740 riders injured respectively. So how can the 2 cities be tied for 3rd in a race given their population differences and injury counts? The simple answer is the kill count – both are the same, and without an obfuscating rosy board of tourism or chamber of commerce statistical sleight of hand, this absolute number is the final arbiter at this time. Yes it is possible to have parallel rankings for death and injury, and it is possible to add death and injury totals to create an index to rank the cities, however, indexing by absolute numbers of riders killed and providing the resultant data on injuries as a byproduct speeds our delivery of actionable material to get the death count down across the county. When is it safe to ride? The following chart is a compilation of injuries as they occurred in 3 hour segments over the course of a year. One quarter of collisions occur between 3 and 6 p.m. but the hours before 3 and after 6 indicate a 19% rise and a 18% fall from the 25% peak. The morning commute is easily spotted with 16% of collisions happening from 6-9 a.m.
Two thirds of collisions occur in the 12 hours from noon to midnight, which also might indicate bike riders not being visible to others on the road, and it is close to Santa Ana’s 72%. Is there a cross commute going on here? Again, it would be wrong to to notice broadside collisions, with a predominate wrong way riding with the majority of collisions happening from noon to midnight by infering that riders are getting broadsided because they can’t be seen and drivers aren’t looking for traffic coming from the right. That would be just wrong so we won’t do it. Garden Grove has a tough challenge to make the streets safer for everyone, and if they could get their data records in to Sacramento in a timely fashion, we would know sooner whether actions taken have had their desired effect, and if not, what course of action is best suited for the problem at hand. While we can’t help move their data faster, we do welcome working with city and county staff and other agencies to develop an effective outreach program to better meet the safety needs of all bike riders in the city. This entry was posted in Garden Grove, Planning, Safety and tagged bike safety, commute, fatality, injury, ocbc, traffic by Pete van Nuys. Bookmark the permalink.